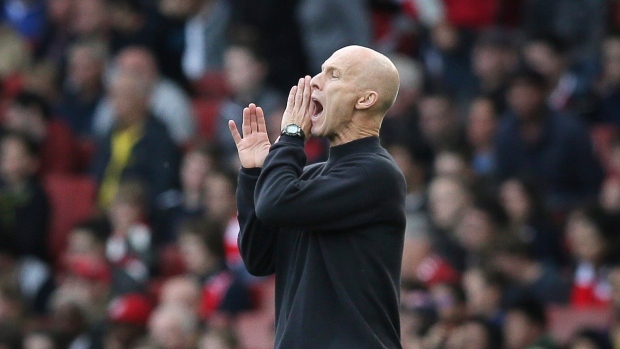 LONDON — Bob Bradley's debut as an English Premier League manager brought mixed emotions for the former U.S. coach. Arsenal beat Swansea 3-2 in a thrilling game Saturday at Emirates Stadium, handing Bradley a loss as he became the first American to manage in the league. "It's a proud moment to walk out there today, for sure," the 58-year-old Bradley said. "That was an exciting game, but it didn't finish the way we wanted." The scale of the task facing Bradley became clearer in a woeful defensive showing from his team. Twice in seven first-half minutes, Swansea created its own downfall, failing to clear the ball. England winger Theo Walcott scored both times from inside the 6-yard box. Mesut Ozil's stunning second-half volley ultimately secured a sixth consecutive league victory for Arsenal. Perhaps Bradley could take consolation from the fight his side showed, getting goals from Gylfi Sigurdsson and Borja Baston. "We're disappointed, but the feeling among the players is that if we can take the starting points we saw today and keep going, 30 more times, there's a chance to become a really good team," Bradley said. Swansea's fourth consecutive league defeat added up to its worst start to a season in any division with just four points from its eight games. Arsenal, meanwhile, moved even on points with league leader Manchester City, trailing Pep Guardiola's club on goal difference. "I thought we played in patches some fantastic football," Arsenal manager Arsene Wenger said. "But at 2-0 and 3-1 we lost our focus." Arsenal's in-form trio of Alexis Sanchez, Ozil, and Walcott continued to produce the sort of passing and movement that opposing defences have struggled to cope with. Arsenal made its early territorial dominance pay in the 26th minute as Sanchez's looping pass found Hector Bellerin on the right of the box. He headed down the ball for Walcott to poke home — only after Jordi Amat and Lukasz Fabianski wasted opportunities to clear. Seven minutes later, Walcott was celebrating his fifth league goal after Jack Cork was guilty of failing to clear Santi Cazorla's corner kick. Arsenal was seemingly on its way to a comfortable victory until carelessness from Granit Xhaka gifted the ball on the edge of his box to Sigurdsson, who expertly found the top corner with a curling left-footed shot in first-half stoppage time. Arsenal appeared to have put away the visitors when Ozil found the top corner with a sublime volley from Sanchez's cross to the back post. But Swansea, inspired by Gambia winger Modou Barrow, was not resigned to defeat. Barrow repeatedly burst past Nacho Monreal, and made his dominance over the Arsenal left back count in the 66th, when he centred for substitute Baston to pull Swansea back into the game. The Barrow show continued as, four minutes later, he was hacked down by Xhaka, who was shown a straight red card by referee Jonathan Moss, completing a highly forgettable afternoon for the midfielder. In a sign of what he expects from his players, Bradley insisted there was more to come from Barrow. "I think he's just scratching the surface," Bradley said. "I was pleased that what I saw today was positive, but I already told him that I'm not going to be easier on him next week." With a man advantage and its confidence boosted, Swansea wasted two fine opportunities to equalize. First, Barrow headed Wayne Routledge's cross straight at keeper Petr Cech, and Sigurdsson failed to convert his cross. There's another debut ahead for Bradley in the next round, his first EPL home match at the Liberty Stadium against Watford on Oct. 22. "I know that next week's game will be a very different kind of game," Bradley said. "And of course at home there'll be more pressure given the tough stretch the team has gone through."